Guangzhou (AsiaNews) – The Holy See has asked Bishop Peter Zhuang Jianjian of Shantou in southern Guangdong province to retire in order to give way to an excommunicated bishop while another Vatican-appointed bishop was asked to downgrade himself as the assistant of an illicit bishop. This is the second time in three months that the Holy See made the resignation demand on Bishop Zhuang, who was secretly ordained in 2006 with Vatican approval. However, he is only recognized as priest by the Chinese government, which on the other hand is in full support of the excommunicated Bishop Huang Bingzhang, a long-time member in the National People’s Congress, China’s parliament. A letter dated 26 October demanded the 88-year-old bishop to resign to give way to the excommunicated bishop, whom the Holy See is going to recognize. “Bishop Zhuang at that time refused to obey and rather ‘carry His Cross’ for being disobedience,” a church source in Guangdong who asked not to be named told Asia News. In the latest incident, Bishop Zhuang was escorted to Beijing 18-22 December from his southern diocese to meet some senior officials from the central government and a delegation from the Vatican, according to the church source. Before the trip, the officials began to monitor Bishop Zhuang on 11 December. Even knowing the bishop was not in good health and the weather was freezing in Beijing, they rejected his demand not to go to northern China but sent a doctor along. A total of seven local government officials went along with Bishop Zhuang but no priest was allowed to follow him, the source said. Staying at the Huguosi Hotel in Beijing, Bishop Zhuang was taken to sightseeing on 19 December and then to the headquarters of the Chinese Catholic Patriotic Association (CCPA) and the bishops’ conference the next day, where he met with Bishops Ma Yinglin, Shen Bin and Guo Jincai, the president, vice president and secretary general of the bishops’ conference respectively, the source continued. The CCPA and bishops’ conference, as well as Ma and Guo, two illicit bishops, are not yet recognized by the Holy See. Our editor tries to update the bonus conditions in the online casino reviews regularly. On 21 December, Bishop Zhuang was taken to the Diaoyutai State Guesthouse. He was first greeted by three officials from the State Administration for Religious Affairs. Then he was led by Fr Huang Baoguo, a Chinese priest who is serving at the Congregation for the Evangelization of Peoples, to meet with a foreign bishop and three foreign priests from the Vatican. Since China and the Vatican resumed official contact in 2014, Archbishop Claudio Maria Celli, a veteran in China Church affairs, is known to be responsible for the negotiations and has been in China several times for this purpose. It is believed the prelate whom Bishop Zhuang met is Archbishop Celli. The foreign bishop explained the aim of their travel to China was to do something in order to reach understanding with the Chinese government, and that is to let Bishop Huang to become the legitimate bishop of the diocese, the source said. The Holy See delegation demanded Bishop Zhuang to retire just as what was in the letter dated Oct 26 but with one addition term seems to console the elderly bishop, and that is, he could nominate three priests for Bishop Huang to pick one as his vicar general, the source continued. 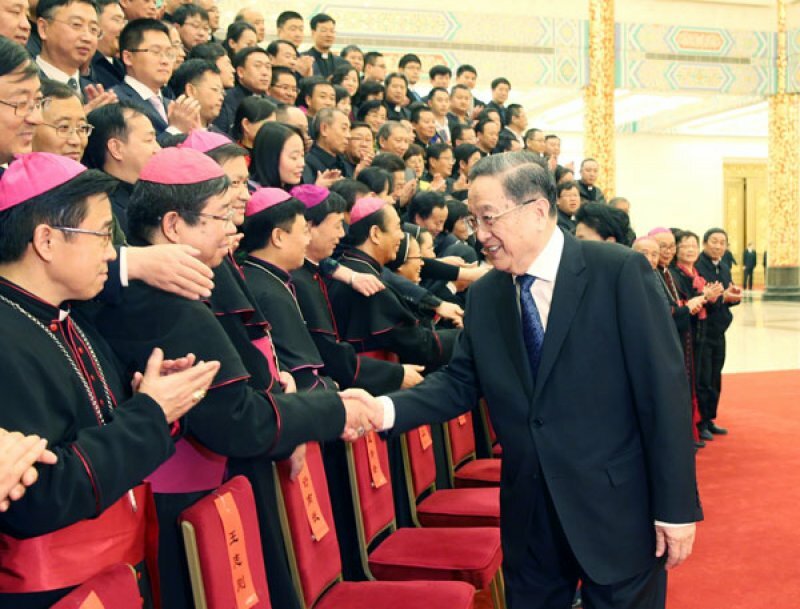 Some bishops in southern China opposed the idea of hastily recognizing Bishop Huang, who was officially excommunicated by the Holy See in 2011 when he accepted illicit episcopal ordination without papal mandate. One of the bishops who asked not to be named told Asia News that the Vatican has asked for their opinions. “I did not know the outcome, but this is a bad solution,” he said. AsiaNews also asked the Vatican for confirmation of the situation in Shantou. A representative familiar with the China dossier said that the letter Mgr Zhuang received was just a request for opinion on the illicit bishop Mgr Huang. Another figure has been silent. Card Joseph Zen, bishop emeritus of Hong Kong, confirmed the information obtained by AsiaNews. While Bishop Zhuang was summoned to freezing Beijing, the Vatican delegation reportedly went southward to eastern Fujian province to meet with Bishop Vincent Zhan Silu, one of the seven illicit bishops awaiting the Vatican to recognize. Local sources said Bishop Joseph Guo Xijin, the ordinary bishop of Mindong belonging to the underground community, was asked to downgrade himself as assistant of Bishop Zhan, with one of the sayings was that he has to downgrade to become a coadjutor bishop. One of the sources said, signing a document to accept “voluntary” downgrading himself as the coadjutor bishop was also one of the conditions the government officials put forward to Bishop Guo in order to recognize him when he was under one-month detention before the Holy Week in 2017. Bishop Zhan declined to confirm the meeting or disclose details about his recognition progress with the Holy See. He only told Asia News that the Vatican and Chinese officials have regular meetings regarding the negotiations. Though the news of downgrading the status of a bishop seems extraordinary or unbelievable in the universal Church, it is not surprising in China. For last October, General Secretary Xi Jinping’s work report in the opening session of the 19th National Congress of the Chinese Communist Party called for “new approaches” adopted for works related to ethnic and religious affairs. An earlier article on Qiushi, a top-level journal on Communist theory run by the Party’s Central Committee, published on 15 September also carried the title “Theory and Innovative Practice on Religious Work since the 18th National Congress of the CPC” in 2012. Though without clear elaboration on what will be the innovative practice to the Catholic Church, the CCPA and the bishops’ conference have passed a five-year plan to “sinicize” the Catholic Church on 14 December. The direction of “Sinicization of religion” is a term first mentioned by Xi Jinping in the Central United Front Work Meeting in 2015. The gist is to demand all religions to uphold an independent principle and followed the leadership of the Community Party. For the Holy See to recognize seven illicit bishops (originally eight but one died in 2017), among whom Bishop Huang and two others were publicly excommunicated by the Holy See, is part of the thorny issues to resolve in China-Vatican negotiations. In exchange, China would have to recognize about 20 bishop candidates appointed by the Holy See, with some even secretly ordained already, for the open Church community in recent years, as well as close to 40 bishops in the underground community. According to an article by Cardinal John Tong in 2017, the core problem to be resolved in closed-door negotiations between China and the Vatican is the appointment of bishops.